Think your Rogue One: A Star Wars Story toy shopping adventure is over? Have you been to Kohl’s yet? How about Walgreens? Entertainment Earth? Here are six sets of retailer-exclusive Hasbro Star Wars toys to add to your shopping list. The shorter versions of Hasbro’s premium Star Wars Black line of figures are so much better than the traditional 3.75 inch toys it’s a wonder they haven’t replaced them completely. Walmart’s got a set of four movie figures taking the black this fall, including the ever-present Jyn Erso, Captain Cassian Andor, the Imperial Death Trooper and the Scarif Stormtrooper Squad Leader. The 3.75 inch exclusives run for $12.99 and should be showing up on store shelves alongside old favorites like Lando Calrissian and Ahsoka Tano from Star Wars: Rebels. Not to be outdone, Target has three of Walmart’s three figures in the larger six-inch form factor, bundled together in a $60 three-pack. The Death Trooper has an exclusive pauldron and ammo pack, while Erso has a hat. Captain Generic Fantasy Name just looks like a bigger version of himself. Walgreens, where I get my heart medication filled, is kicking it old school with an exclusive Episode IV version of everyone’s favorite annoying robot. Sorry, annoying droid. Black Series Episode IV C-3PO stands ready to whine and complain for hours on end. The six-inch, $20 figure sports the silver leg that most certainly always existed but also never did. It’s a conundrum. My favorite exclusive set comes from the fine folks at online retailer Entertainment Earth and the space between the original trilogy and prequels. Clone Troopers are the bomb, baby, and this $79.99 four-pack of six-inch Black Series figures are the diggity, which are things people totally still say. 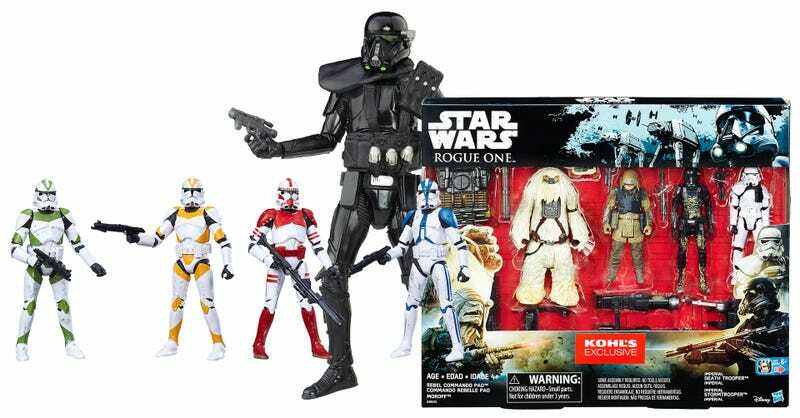 The set includes troopers from the 442nf Siege Battalion, 212th Attack Battalion, an Elite Shocktrooper and one from the 501st Legion. Or you can just call them green, yellow, red and blue. Either way, they look lovely and I want them. Kohl’s doesn’t get a Black Series figure set. Kohl’s gets traditional 3.75 inch figures, and Kohl’s better not complain or it gets nothing. Know your place, Kohl’s. Rebels Pao and Moroff face off against the Death Trooper and Stormtrooper in this $34.99 four-pack of figures that you can probably find separately. It’s not a bad set, packed with plenty of accessories. It’s just at Kohl’s. Finally we have Toys’R’Us, which paints the ridiculously entertaining Interactech Storm Trooper Black and sells him as the Interactech Shadow Trooper. The $29.99 toy is guaranteed to be much harder to see than the original, but just as entertaining. The Hasbro rep at Toy Fair showing off the Interactech Stormtrooper was loosing her stuff over the sounds this thing makes when you lay it flat. Poor, helpless Stromtrooper. So how’s your Rogue One toy shopping going? Did you grab a bunch of stuff, or are you waiting for the movie to make sure you don’t wind up with a large collection of shiny figures of a character that’s only on screen for five minutes?